Vault Boy has been in some pretty rough situations during his many lives, but nothing quite like this. Artist Brian Menze was employed at Black Isle Studios during the production of Fallout 2, creating the new Vault Boy pictures included in the game back in 1998. He's currently working for Obsidian Entertainment on various projects including Fallout: New Vegas, but recently gained the public's attention for posting work from the old days on his DeviantArt page. The image you see here is rejected art for the "Childkiller" reputation that would be bestowed on the player in Fallout 2 if he happened to kill a child, accidentally or not. 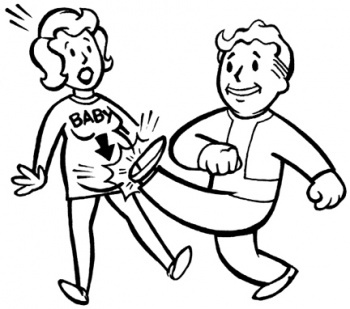 This image was unused and the only Vault Boy image to ever be cut from Fallout 2. (I'm sure you can figure out why) I remember when I got the request to do a perk illustration for "child Killer" that there would be no way to keep in from being offensive. I mean really! How do you make an illustration of "child killer" and keep it from being offensive? Anyway for some reason, I thought this was the least offensive way to do it. I have no idea what i was thinking. Even the designer who requested it realized it was a bad idea, so we nixed it. Looking back on it now, I can't believe I drew this. As Menze says, his work here is harsh, but no matter what he did he was destined to draw something that would be rejected. The image is such a paradox: it's got the awesome Vault Boy that we all know and love looking happy and just doing his thing, which happens to be an incredibly horrible act. The woman appears as if she's thinking: "Oh my goodness gracious, you've just killed my unborn child!" My natural reaction is to laugh or smile at the Vault Boy, but I feel as if it would send me straight to hell in this situation. Still, this is a nice view behind the scenes at a development studio, giving us a look at what gets the yay and nay. I'm not for censorship, but I think we can all agree that it's good this one got the nay.